The International Map Year 2015-16 has been officially launched by Georg Gartner, president of ICA. This will be part of the activities planned for the next year by our commission, the Commission on Planetary Cartography. Here is what happened at the commission meeting in Rio de Janeiro today. We discussed the possibility of a future book on planetary cartography in which chapters would be organized around one theme with authors from different countries, describing their working methods. We discussed the development of an online International Multilingual Gazetteer of Planetary Nomenclature. We have agreed on organizing special events such as map exhibitions as part of the International Map Year. We will continue the series of Multilingual Maps of Terrestrial Planets and Their Moons with the Galilean Satellites, as it was proposed by Kira Shigareva. Our place in the community: Planetary Cartography has several professional organizations worldwide: NASA’s Planetary Data Archiving, Restoration, and Tools program, and NASA’s planet-specific Data Analysis Programs provides funding and implementation – through USGS – of new geological and thematic planetary mapping of results derived from US space missions. Planetary mapping of results from European missions are implemented by DLR. Aside ICA, another professional organization dealing with planetary cartography is ISPRS WG IV/8 Planetary Mapping and Spatial Databases which provides definition and development of planetary cartography resources for professional cartographers. In this environment, ICA’s Commission on Planetary Cartography is focusing on involvement of classical cartographic products that involve no new base research, but are the cartographic representations of planetary surfaces utilizing already published data. Nevertheless, these are higher order products or products of historic importance. The commission also aims at opening the so-called planetary geological and other thematic mapping to non-US citizens. We would like to note in this report that one of the co-founders of the Commission, also a co-chair at that time, Kira Shingareva passed away in 2013. This is a great loss for the planetary cartographic community. Hargitai H and 11 others (2015) Multilingual Narrative Planetary Maps for Children. Lect. Notes Geoinf., Cartography, Claudia Robbi Sluter et al. (Eds): Cartography – Maps Connecting the World. On another pathway, we have started to explore the opportunities of ArcGIS related planetary mapping projects, but no project was completed. The GIS projects underway are extracting spatial data from professional publications and make them publicly available through our website, in ArcGIS-ready format. An important addition deals with the ontology and symbology of planetary cartography. This project is carried out in Germany. Paper: Stephan van Gasselt, Andrea Naß (2013) Planetary Geologic Mapping: Initial Thoughts on an Ontology Framework. 26th International Cartographic Conference, Dresden. Paper: Country Movers – an Extraterrestrial Geographical Application. Cartography Beyond the Ordinary World Symposium, Niteroi, 21-22 August 2015. We have co-authored a paper on Chinese and Russian planetary gazetteer development that can serve as type examples for future gazetteers. Historic toponym research and database-building is conducted by Thomas Gangale and Marilyn Dudley-Flores. Paper: Thomas Gangale and Marilyn Dudley-Flores (2013) Proposed Additions to the Cartographic Database of Mars. 26th International Cartographic Conference, Dresden. This project was not implemented. Instead, we have focused on creating a series of children’s maps that can serve as a basemap for future drawing competitions. This project was not realized. Instead of a textbook, an encyclopedia was developed with thematic entries on planetary landforms, and features. Only informal contacts have been made as the commission moved to different pathways as these organizations. 1Karachevtseva, I.; 2Kokhanov, A.; 3Rodionova, Z.; 4Konopikhin, A.; 5Zubarev, A.; 6Nadezhdina, I.; 7Kozlova, N.; 7Oberst, J. We have prepared an Atlas of Phobos, which based on new data from Mars Express mission and innovative techniques for recently derived Phobos control point network and shape model (Nadezhdina and Zubarev, 2014; Oberst et al., 2014). The Atlas contains results of Phobos research, based on Mars Express images from the HRSC Camera including its SRC-Channel (Oberst et al., 2008): gravity field working models and studies their characteristics (Uchaev Dm. et al., 2013); geomorphologic properties of craters (Basilevsky et al., 2014); calculations of surface roughness (Karachevtseva et al., 2012); morphometric studies (Kokhanov et al., 2013); statistics of crater size-frequency distributions based on multi-fractal approach (Uchaev Dm. et al., 2012); and surface compositional studies based on HRSC color-channel data (Patsyn et al., 2012). The Atlas includes 42 thematic maps describing various aspects of the surface of the small irregular body with various scale: from global maps (1: 250 000) to several local maps based on images with high resolution (1: 60 000-1: 40 000). The structure of Atlas consists of four chapters and describe some aspects of Phobos research and mapping: 1) History of Phobos mapping in Russia; 2) Control point network, shape model and gravity field of Phobos. 3) GIS-analyses of Phobos’ surface. 4) Geomorphologic studies of Phobos. Different coordinate systems are used to match the map content and Atlas format, for which we choose a page size of A4 (320 mm × 220 mm). The maps are based on the sphere with radius 11.1 km according to IAU recommendations (Archinal et al., 2011). While the Atlas prepared in Russian, feature names is presented in bilingual form (Russian and English). To maintain heritage and continuity with previous mapping of Martian satellite in Russia Atlas includes map of surface based on design of first Russian Phobos map produced for mission Phobos-1 and -2 (1988). The preliminary version of the map was published before the missions started, 30 March, 1988 (now is available at the web-page http://planetologia.elte.hu/ipcd/phobos_map.jpg). During preparation for those missions new cartography projections and map design were developed by Lev Bugaevskiy and Kira Shingareva (Bugaevskiy, 1987; Bugaevskiy et al., 1992). The new Phobos Atlas is held in memory of these Russian cartographers with which efforts was created the first Russian Phobos map. The digital versions of the Phobos maps from the Atlas will be placed into the MIIGAiK Extraterrestrial Laboratory web-page (http://mexlab.miigaik.ru/eng/). Data products which were used for the mapping also will be available at the MExLab Geoportal (http://cartsrv.mexlab.ru/geoportal/) (Karachevtseva et al., 2014). 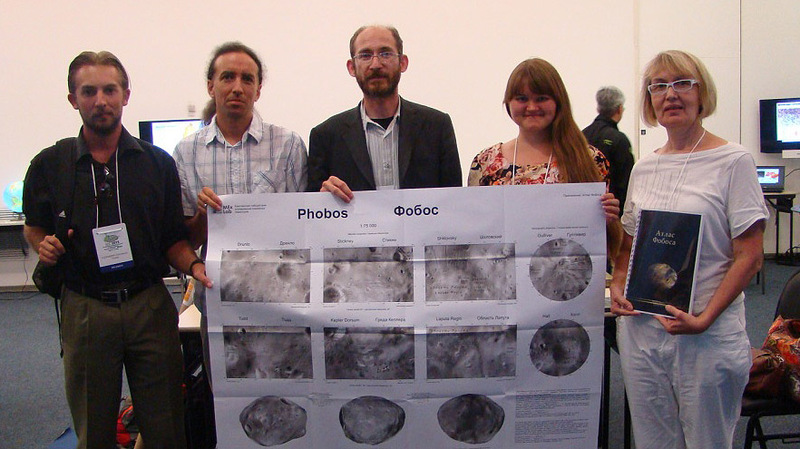 Printed version of a new Phobos Atlas will be presented at the conference. Archinal, B. A. et al., 2009. Celestial Mechanics and Dynamical Astronomy, 2011, 109, 101–135. Bugaevsky L.M. 1985, Izvestiya VUZov, ser. Geod. i Aerofot. # 4, pp.79-90, 1987 (in Russian). Karachevtseva I. P., et al., 2012. CPRSES, pp. 304-311 (in Russian). Karachevtseva I.P et al., 2014, PSS, V.102, pp. 74-85. Kokhanov A.A. et al., 2013, LPSC44 [# 2289]. Nadezhdina I.E., Zubarev A.E. 2014, SSR, V.48, № 4, p. 1–10. Oberst J., et al., 2008. PSS. 56, 473–491. Patsyn V.S, et al., 2014 CPRSES, V. 9, № 4, pp. 312-318 (in Russian). Uchaev, Dm.et al., 2012. Izv. Vyssh. Uchevn. Zaved., Geod. Aerofotos”emka # 6, 3-8 (in Russian). 1Dietzsch, G.; 2Mendes, J.; 3Rigaud, R.
This paper communicates the results obtained from an aerial survey analysis, for the location Cuiabá, Mato Grosso, performed in partnership between the Institute of Aeronautical Cartography (ICA) and Squadron 1/6° Aviation Group, both subordinate to the Brazilian Air Force. The survey under analysis used an ADS-80 camera. During this analysis, two study methodologies were used for post-processed data: by Precise Point and by Relative Positioning. Afterwards, the positional differences generated by those methods were evaluated. 1Kozlova, N.; 2Nadezhdina, I.; 3Zubarev, A.; 4Patraty, V.; 5Kokhanov, A.; 6Matveev, E.; 7Karachevtseva, I.; 8Oberst, J. Introduction. Main source for planetary mapping is images collected by different spacecrafts. To obtain a primary cartographic product such as an orthorectified image, it is necessary to perform preliminary geodetic and photogrammetric operations of creating a control network and a digital elevation model (DEM). The study. Most spacecraft are not designed for stereo imaging of a planetary surface. This fact complicates obtaining of a precise primary cartographic product because we have to use a preliminary terrain model obtained from a control point network (Zubarev et al, 2014). A control point network is a set of points depicting the global shape of a body. In most cases a global terrain model derived from control points doesn’t characterize local relief. It causes local distortions of orthorectified images that lead to mismatch of overlapping images involved in mosaicking. It is especially important to have a detailed DEM for large-scale mapping of the surface. At our laboratory we study a lot of celestial bodies (e.g. Phobos, Europa, Enceladus, Ganymede, the Moon, Mars, Mercury, etc. ), however, for the Moon we have images with the best resolution (LRO NAC provides images up to 0.3 m/pixel). Such data allows us to study regions of interest in more detail. Using the technique for LRO NAC stereo image processing developed at MExLab we create DEMs and orthomosaics (Zubarev et al, 2012), and use them as base products for future studies and mapping. Main goals of our lunar research are: – Geomorphologic and morphometric analyses of lunar surface based on DEMs and orthomosaics. We study different regions (mare, highlands, polar) to evaluate differences and similarities (Basilevsky et al., 2014) and use the results for landing site selection for future missions Luna-Glob and Luna-Resource. – Study of Soviet lunar missions. High resolution LRO NAC images allow us to distinguish Lunokhod wheel tracks and refine the routes of the rovers. For landing sites detailed DEMs and orthomosaic were derived, and large-scale maps were created. Also we process surface panoramic images obtained by Lunokhods during the missions. The resolution of panoramas is 0.06 degrees and they were taken from distance of about 1.4m from the surface, so using them we can investigate small craters and stones (~1 m) (Kozlova et al., 2014) – MIIGAiK planetary geodesy and cartography geodatabase. The planetary data model is designed for spatial information management in the geodatabase and for effective access to the storage of the results of thematic processing of the Moon remote sensing data (http://cartsrv.mexlab.ru/geoportal/). Conclusion. Results of geodetic and photogrammetric processing of image data (DEMs and orthomosaics) serve as a basis for detailed research of the celestial body (geologic, morphometric, etc.) as well as for thematic mapping. All maps and results of geomorphology analyses will be combined in an Atlas of large-scale topography of the Moon. Acknowledgements. This work was carried out at MIIGAiK and supported by Russian Science Foundation, project #14-22-00197. The work on Lunokhod panoramic image processing is supported by the European Community’s Seventh Framework Programme (FP7/2007-2013) under grant agreement № 312377 PRoViDE. Basilevsky A. et al. Morphometry of small impact craters in the Lunokhod-1 and Lunokhod-2 study areas / Elsevier, Planetary and Space Science 92, 2014, p.77-87. Kozlova N.et al. Some aspects of modern photogrammetric image processing of Soviet Lunokhod panoramas and their implemenation for new studies of lunar surface / ISPRS Archives MTSTC4-2014-103, XL-4, 2014, p.121-126. Zubarev A. et al. High-resolution terrain models from LRO stereo images for Luna-Glob landing site selection / abs. 3MS3-PS-13, 2012. Zubarev A. et al. New methodology for study of the basic geodetic parameters and relief of outer planetary bodies: Galilean satellites and Enceladus / abs. 5MS3-GP-4, 2014. 1Albert, G.; 2Ungvári, Z.; 3Merk, Z.; 4Gede, M.
In 2014 a new geological map of Mars was published by the USGS (Tanaka et. al 2014). It contains information about the extensional and compressional forces once were active on the planet. This information can be publicly accessed in the geodatabase of the map (i.e. structural lines: wrinkle ridges and grabens). These structures are in geological units mainly from the Noachian and the Hesperian periods (4.1-3.7 and 3.7-3.0 billion years bp. respectively), but a few of them appears in Amazonian units as well (younger than 3.0 billion years). Thus, the force-field which produced these objects vanished long time ago. Despite of this, the analysis and visualization of the stress-tensors may help to fine-tune and understand the global models of the Red Planet. The analysis is based on a projected 2D tensor field which was generated from the lineament pattern. The dynamics (i.e. tension or contraction) of the lines were explained in the original map database (Tanaka et. al 2014). To calculate the tensors, the linear elements were classified according to the dynamical parameters. The polyline sections of the map lineaments were considered vectors (i.e. line sections), and the tensor directions were generated attributes of these vectors. Subsequently, an irregular point cloud of the tensors was generated and processed with a component-wise interpolation. The interpolated values appear on contour/heat and tensor maps, and show the relative stress field of Mars approximately at the end of the Hesperian Period. The generated maps are displayed as overlays on the virtual globe of Google Mars. Tanaka, K.L., Skinner, J.A., Jr., Dohm, J.M., Irwin, R.P., III, Kolb, E.J., Fortezzo, C.M., Platz, T., Michael, G.G., and Hare, T.M., 2014, Geologic map of Mars: U.S. Geological Survey Scientific Investigations Map 3292, scale 1:20,000,000, pamphlet 43 p., http://dx.doi.org/10.3133/sim3292. 1Kokhanov, A.; 2Karachevtseva, I.; 3Kreslavsky, M.
Topographic roughness maps of Mercury at different baselines were created with the latest data acquired by Mercury Laser Altimeter (MLA) onboard MESSENGER mission. Although the altimeter data are available for the northern polar regions of the planet only, they provide a new look at the features of topography of Mercury. The obtained preliminary results indicate a clear distinction between relatively smooth plains and rough areas of the northern hemisphere of Mercury; they also enable a comparison with statistical characteristics of topography of the Moon. Roughness maps in some sense can carry more information, than topographic maps or images of surface. Usually the planar distance between orbital laser altimeter measurements is less than a typical distance between orbits. As a result, the spatial resolution of topographic data is much better, than spatial resolution of derived topographic maps. Mapping of roughness. In this research we calculate roughness on the base of MLA (Cavanaugh et al., 2007) data. Due to amount of laser altimeter measurements and eccentricity of the spacecraft orbit by this time we able to crate map only for the northern subpolar area of Mercury between 65° and 84°N. For the Moon, we used LOLA-derived lunar roughness map (Kreslavsky et al., 2013) The topographic roughness was calculated as the interquartile range of along-profile curvature at three baselines: 0.7, 2.8 and 11.2 km. The most obvious feature on these color maps is the dichotomy between smooth plains and rough cratered regions, which is similar to the lunar dichotomy between mare and highland areas. However, roughness of cratered areas on Mercury is lower than that of lunar highlands calculated the same way. The layout contains: map of the lunar roughness on base 0.48 km (1:7 000 000) and map of the Mercury roughness on base 0.7 km (1:10 000 000). Both of maps are projected in oblique orthographic projection for the best representation of the northern sub-polar areas. While the whole Moon surface is covered by the roughness data combined with hill-shade, on Mercury only the northern sub-polar area has roughness data, and MDIS mosaic (http://www.messenger-education.org) is used on the other areas. According to the IAU recommendations (Archinal et al., 2011) the longitude on the Moon is defined from 0° to 360° with east-positive direction, while on Mercury, from 0° to 360° with west-positive direction. Created maps can be used for comparative analysis of the differences surface of celestial bodies, which is an important aspect of the application of cartographic methods in planetary research. For example, roughness of cratered terrains in the mapped area of Mercury is lower than that of lunar highlands. Detail analysis of this difference is an interesting study that can be done with the map. References: Archinal, B. A., A′Hearn, M. F., Bowell, E., Conrad, A., Consolmagno, G. J., Courtin, R., Fukushima, T., Hestroffer, D., Hilton, J. L., Krasinsky, G. A., Neu-mann, G., Oberst, J., Seidelmann, P. K., Stooke, P., Tholen, D. J., Thomas, P. C., Williams, I. P. 2011, Report of the IAU working group on cartographic coordi-nates and rotational elements: 2009. Celestial Mechanics and Dynamical Astronomy 109, 101–135. 1Rodionova, Z.; 2Karachevtseva, I.; 3Lazarev, E.; 4Kokhanov, A. Here we present the wall maps of the Moon and Phobos, which demonstrate topography of the celestial bodies. 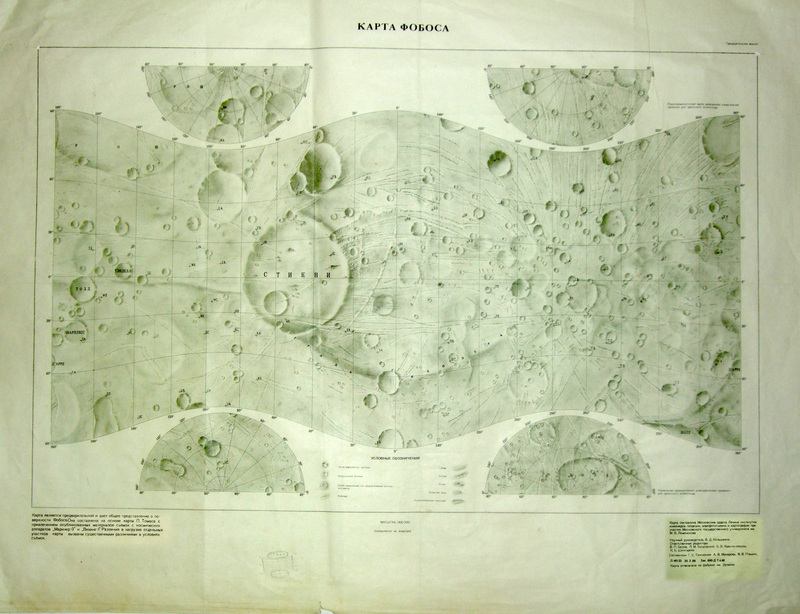 Maps of the Moon are widely used for solving important scientific tasks (Rodionova, 2000). The Hypsometric Map of the Moon is created on base of LOLA data (Smith, et al., 2010) at a scale 1:13 000 000. This map shows near and far sides of the Moon in the Lambert equal area projection. Relief is shown by contours with the combination of the hypsometric scale and shading relief (Grishakina and Lazarev, 2013). The medium level of the lunar surface is 1737.4 km and serves as zero level for heights. The height’s range on the Moon is 19.8 km. The Hypsometric Map of the Moon shows topography on the most accurate measurement to date in a global scale. Another view of the Moon’s topography is based on results of photogrammetry processing of LRO camera images (Robinson, et al., 2010): digital terrain model (DTM) GLD 100 and orthomosaic produced from LRO WAC (Scholten, et al., 2012). The layout contains two maps with relief parameters: roughness and hill-shaded relief. Both of them are created in orthographic projection with centre in 35°N and 280°E to show the eastern margin between near and far sides and the difference in its roughness. 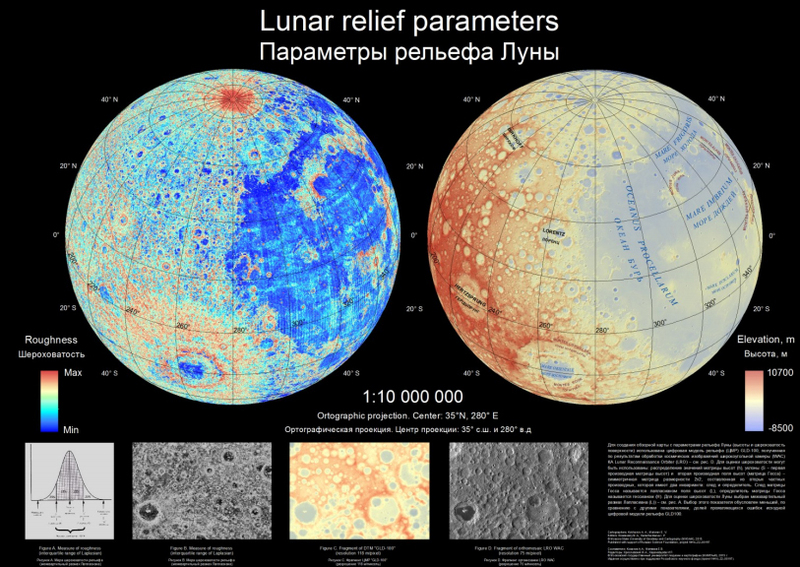 Moreover, these parameters of projection allows us to show on the both maps the most significant structures of the Lunar surface (impact basin Mare Orientale, montes of the near side and the North Pole region). Roughness of the Lunar surface is calculated as interquartile range of Laplasian (Kokhanov et al., 2013). Maps in the layout are created at the scale 1:7 000 000 and supplemented with illustrations. The map of the Martian moon – Phobos is created on the base of the newest Mars Express data: DTM and orthomosaic, produced from SRC-channel stereo images (Zubarev et al., 2012; Karachevtseva et al., 2014). The map is composed of 5 parts: one for the centre belt between 60°N and 60°S in modified Bugaevsky conformal cylindrical projection for 3-axial ellipsoid and four parts for the half-polar regions in equidistant azimuthal projection for 3-axial ellipsoid. Named features and description for the names are given in two languages (Russian and Latin). 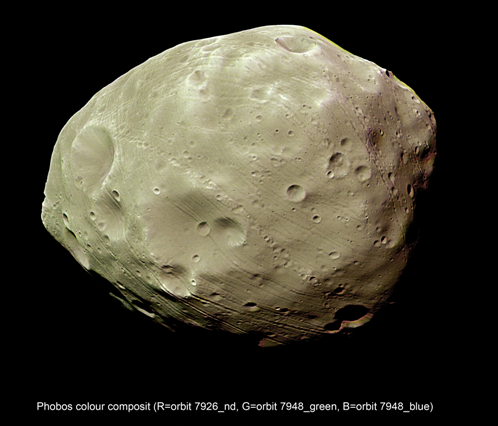 The map is supplemented by examples of 3D-modelling, which colour scheme is designed to be similar to the Phobos colour images (Neukum, 2010). Using the newest data and modern GIS technology we performed the Moon and Phobos maps using specially created digital products. Each map was designed in its special way for the best presentation of the mapped aspects: topography and roughness for the Moon or irregular shape and features of Phobos. Named features are given based on Planetary nomenclature supported by IAU (planetarynames.wr.usgs.gov). Information in the maps is presented in clear and comprehensible form that makes them interesting not only for professionals but also for all those interested in astronomy. Rodionova J.F. (2000) ICEUM-4 Proc. Fourth Int. Conf. on the Exploration and Utilisation of the Moon, pp. 11-13. Scholten F. et al. (2012) JGR. Vol. 117. E00H17. Smith D. E. and 30 collegues. (2010) SSR. Vol. 150. pp. 209-241. Zubarev А., Nadezhdina I. and Konopikhin. (2012) CPRSES. . Vol. 9. pp. 277-285 (in Russian). 1Hargitai, H.; 2Gede, M.; 3Zimbelman, J.; 4Kőszeghy, C.; 5Sirály, D.; 6Marinangeli, L.; 7Barata, T.; 8López, I.; 9Szakács, A.; 10Dębniak, K.; 11Feuillet, T.
As part of the outreach acivity of ICA Commission on Planetary Cartography, we have developed a new series of planetary maps targeting young readers. Our hypothesis was that the cooperation of graphic artists, planetary scientists and cartographers may result in new ways of planetary surface representation. 1Kereszturi, ; 2Madarász, B.; 3örsi, A.; 4Hargitai, H.
Topography based surface analysis and morphology correlation for the northern hemisphere of Mars – The topographic analysis of the Martian surface might help to understand basic geomorphological connections and improve our understanding in the surface features of the Earth too. In this work we correlated the statistical topographic parameters and the remote sensed image based appearance of various locations along a meridional stripe at the northern hemisphere of Mars. The topographic location of nearly horizontal plains suggests that the erosion and re-deposition was not effective enough to transport the sediments at the topographic lowest point at 50 km distance scale. Great difference could be identified between the topographic height distribution pattern of dif-ferent analyzed terrains, suggesting different variability and complexity in the range in surface feature types there. Terrains resembling the ped-iment-like structures also could be at the analyzed terrains on Mars, but their firm identification requires more detailed analysis. The statistical based topography analysis could give useful input for detailed surface research in geomorphology. Mu, L.; Li, C.; Liu, J.; Zeng, X.; Ren, X.; Zou, X. The Moon is a special extraterrestrial body, without atmosphere, flowing water, even creatures. So the surface characteristics, such as the texture, the terrain and the color, are unchanged permanently. The images obtained by telescopes , orbiters, even rovers are insistent, and there is not apparent difference in color and texture. Unlike the image, the lunar topographic color coded maps released by USA, Russia, ESA, Japan, China and India are not all unified, which would make a obstacle to understand the topographic information. This research suggest a standard (scale, subdivision, coding, color, media and so on) and a method to present the lunar surface in a uniform style. Chinese cartographers have set up the national standards(lunar spatial coordinate system, Subdivision and numbering for the lunar primary scale topographic maps, which are the foundational standards for lunar mapping ) to produce topographic map at1:10 000~ 2 500 000. The experience and map product shows the unified standard and method is suitable for presentation of paper map, globe, electronic and 3D map. 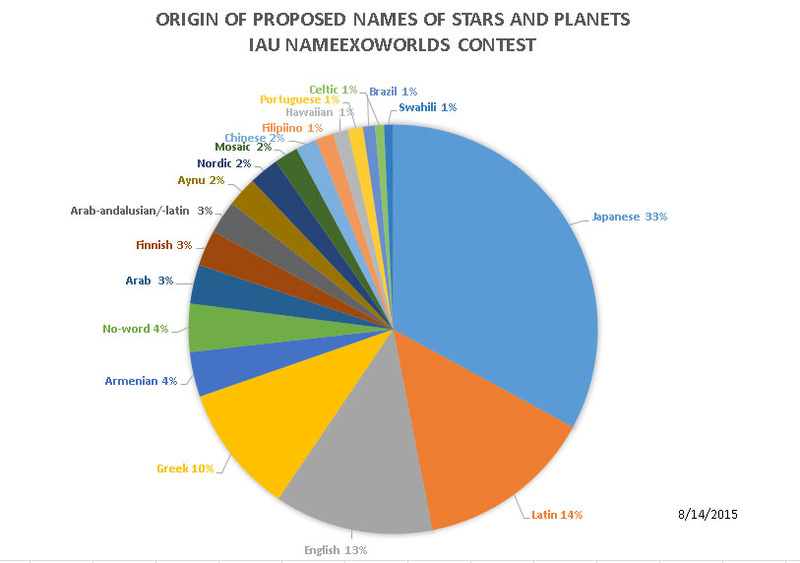 IAU’s contest to name stars and exoplanets has begun. The website lists more than 400 proposals for names of 45 bodies in 20 systems collected from clubs and non-profit organizations. Professional organizations involved in astronomy were locked out from the contest. One-third, or 33% of the proposed names are Japanese words, 14% is of Latin origin, 13% is English, 10% Greek. The rest is shared by Armenian, Arab, Finnish, Ainu, Nordic, Chinese, Filipino, Hawaiian, Portuguese and Brazilian, Celtic and Swahili and additional aboriginal/indigenous words from Australia and South and North America. No other nation is represented in the proposals which means that only the listed nations will have their words placed onto the star and exoplanetary maps. 6% of the proposed words have no meaning: they are random character strings, mosaic words, or abbreviations. Some even have a combination of letters and numbers – the name format the contest was designed to replace. Only 4 of the to-be-renamed star names is a letter-number combination, most of them are classical combinations of greek letters and the name of their constellation. No wonder that some proposed to keep the original names. It is not easy to select from the hundreds of names, partly because the explanation of the names is taken directly from the proposals, which included very different types of details. Some mythological names are spelled in Latin, Greek or French style. If names will be accepted in these formats, it will bring an unprecedented linguistic chaos and ethnic bias into planetary and celestial cartography – and the promise was to keep the winning names. So far, IAU strictly resisted to give any words to any other organization, company or individual in naming stellar and planetary objects (except minor planets) and now the public has an unprecedented freedom to name these object as they like. This may seem to be a 180-degree turn from IAU’s earlier standpoint, when they disapproved New Horizons Pluto mission principal investigator Alan Stern’s Uwingo from collecting new names of exoplanets and Mars craters to raise funds for planetary missions. Now IAU is doing the same, without money involved, by administering a voting website and again not letting professional organizations into their way. (It must be added that IAU did approve Stern’s Pluto surface feature naming project; these names are now in informal status). Although there are no names in the published list that would require the cartographic prudishness as in the case of S. P. Crater in Arizona, there are some interesting English coined proposals – we can say nothing about the Japanese words. So we encourage you to vote the names you like, and see what will fit the star charts to be printed.